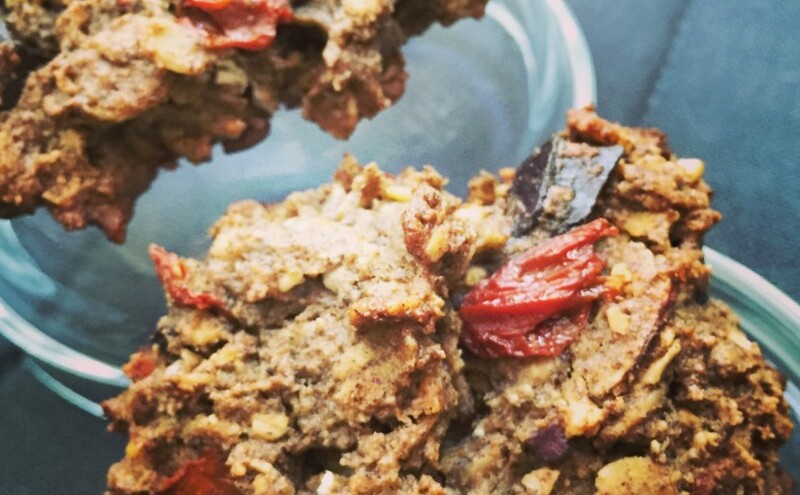 These healthy “cookies” are my absolute favorite version of the Almond Butter Trail Mix cookies. I’ve made a multitude of variations of those guys, while experimenting with different gluten free flours, nut butters, nuts, and dried fruit. My gluten free pal assured me that these ones with cashews and goji berries are the winner. And I couldn’t agree more. In a large bowl, whisk together the cashew butter, coconut oil, agave, and almond milk. Once combined, add the flours, baking soda, and salt until a thick dough forms. Now, add in your extras – oats, cocoa nibs, cashews, gojis, and chopped dark chocolate – and mix until evenly distributed. Wrap the bowl with plastic wrap and refrigerate your dough for at least an hour. Drop the dough onto a cookie sheet lined with parchment paper and bake at 325F for 15-18 minutes. I usually yield about 12 big cookies. Once they are lightly browned but still a little soft on the inside, remove from the oven and transfer to a wire rack to cool. Store cookies in an airtight container. They keep even longer in the fridge!